When Garth’s in the house, hunting takes on a whole new meaning. He’s not on par with many of the hunters we know, but he gets things done. Isn’t that the most important part? The boys team up with Dean’s new buddy in this week’s episode and have an alcohol-fueled adventure. The case itself was confusing, but the high points allowed us to gloss over many of the flaws. Plus, with the surprise ending, our ability to forgive bad writing was at an all-time high. We started off with a good old ghost story around the campfire in the woods. I like those, they’re fun, especially when they end bloody. This used to be their types of cases on the show. Campers get mauled, the authorities will claim it’s a bear, the Winchesters suspect something more sinister, and they sweep in to take out a supernatural creature. So, we got the feeling of returning to simpler times with the opening. Baby brother Trevor sneaks out, drunk, to hang with his big brother Ray and Ray’s friends. He wanders off into the dark woods alone, lets out a scream, and by the time the gang finds him he’s been gutted. And who should take the case but the adorkable Garth. You remember him — the inept hunter that couldn’t follow Bobby’s directions and who got paired up with Dean when Sam was off in honeymoon heaven with Becky. Yes, he does work cases by himself once in a while. And when he starts asking around town he happens upon the legend of Jenny Greentree. A restless spirit haunting the woods and killing campers, it seems like a simple salt and burn will take care of this, so Garth digs up her bones and sets them afire. He even has a catch phrase when he does the deed. How cute is that? Like I said, adorkable. Pity that it wasn’t so easy to solve the crime. When Ray goes back out to the woods to take his revenge on the unseen murderer of his little brother, he meets the same fate. Turns out it wasn’t Jenny Greentree at all. So, Garth calls the Winchesters in for back-up. Dean and Sam are dealing with their own issues at the time. Well, aren’t they always? They left Cas locked in a psych ward with Meg to look after him and Sam’s on the road to mental recovery. Yes, there’s some guilty consciences there. Sam feels like he passed on his crazy to Cas and Dean feels like he lost his friend yet again. If it wasn’t for them living in depression they’d never live at all. But they can’t spend too much time dwelling on it because they’ve got things to do. They’ve got to track down the Leviathans, they’ve got to continue hunting, they’re got to keep living in whatever way they can or else the guilt is going to destroy them. A simple hunt with Garth seems like a good way to take their minds off the larger looming issues, but when has anything in the Winchesters’ lives been simple? Instead, they stumble into a revenge plot and a Shojo on a leash. In real life, the word shojo means a young girl between the ages of 17 and 20. 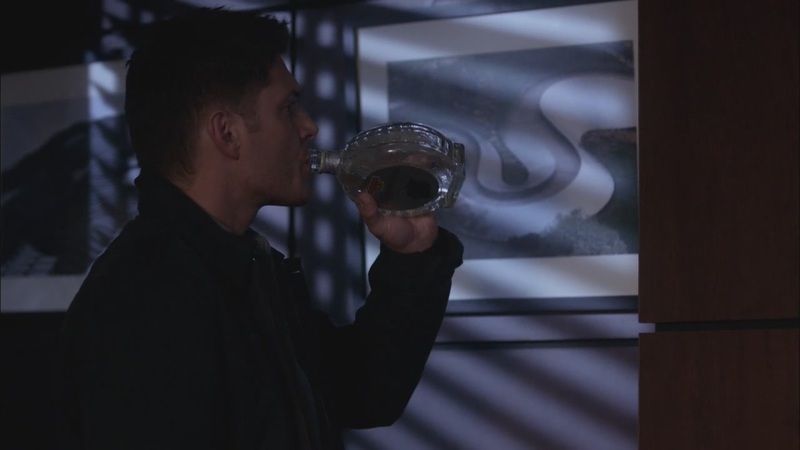 In the world of Supernatural, it’s a Japanese alcohol spirit. No, not a kind of liquor, but literally a sea spirit with a fondness for alcohol who can only be seen when a person is drunk. Sounds like a fun case, huh? I know Dean approves, even though I’m with Sammy on this one. I’m surprised the elder Winchester can even still get drunk considering his alcohol tolerance level. But, where there’s a will there’s a way. Never let it be said that Dean Winchester isn’t up for a challenge. "I mean, can you even get drunk anymore? It's kind of like, uh, drinking a vitamin for you, right?" My problem with the case, which was the fault of the writing, was that the players in the revenge plot were very confusing. We start in the morgue, where Sam says the owner of Thighslapper Ale, Mr. McAnn, was the father of the two boys. Sounds easy, go to the brewery and talk to the dad. Except, when they got there the manager, Marie, is the guy’s daughter, which brings us up to three kids in total. She doesn’t seem that upset that both of her brothers died, but I’m not going to fault her for that. Where my confusion started was when she was talking about this mysterious Dale person, now deceased, and I had no idea who it was in reference to. He seemed to be partial owner of the brewery with her dad and this other Randy Baxter guy. So, already we’ve gone from one owner to three owners, and one of those was already dead when we got here. And while Sam and Garth are questioning Randy over the death of McAnn’s kids, Dean’s talking to Marie about Dale and how her father feels guilty over his death except maybe it was the fault of Dale’s friends, along with the fact Dale’s wife is suing the company for something. Are you confused yet? I am. Then we find out McAnn has a fourth child that we haven’t seen onscreen yet, but since they mentioned it we expected it to be important, which it turns out to be since she shows up in the next scene. Well, she appears long enough for her small daughter to accidentally get drunk and witness her mother’s death. Mommy drank orange juice spiked with vodka, now Mommy’s dead. Hello, years of therapy for that child. 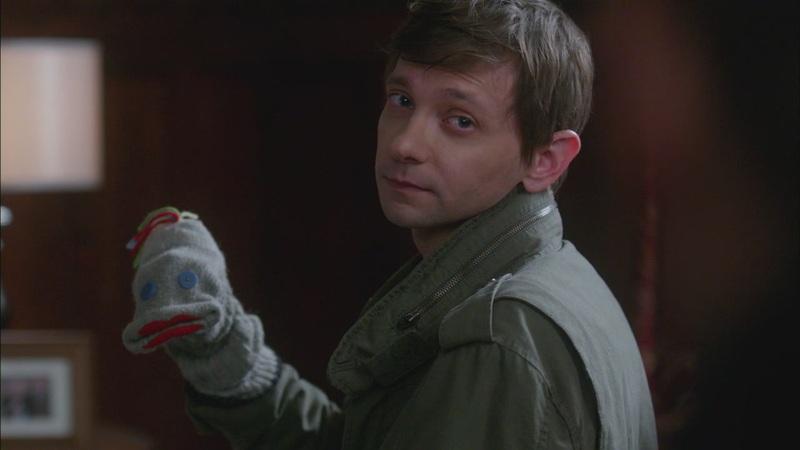 "Mr. Fizzles wants to help Tess. He wants to listen." As the kids start dying, the case starts making a little bit more sense. The less people you have in play, the easier it becomes. Turns out the brewery partners pretty much pushed Dale out because of his unwillingness to sell the company. But dear old Dale got his revenge before he committed suicide. He sent them a cursed box with sake packed inside, and of course the alcohol was cursed, too. When the bottle was opened it unleashed a Shojo and her main mission was to take away the known children of McAnn and the secret son of Randy. It’s a straightforward case from there and it sounds wonderfully fun considering the boys have to get drunk to see her. 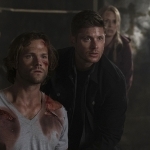 We lay the groundwork for potentially hilarious situations, including seeing how tipsy the Winchesters can actually get while working a case and how Dean enlists the help of a Japanese cook to bless his samurai sword. We even got to see the boys working together, sober Dean wielding the sword while drunk Sammy gave him directions of where to aim. They take out the Shojo, case closed, everybody’s happy. No, not yet. You see, when they were in the middle of the fight, Dean lost his sword. And somehow, like a miracle, it got pushed back into his hands in time for him to defend himself. We’ve taken to attributing these incidents to Bobby and now even Dean’s starting to question it. There’s been too many unexplained occurrences, like the empty beer or the reshuffled papers or the calling card, that nudges them in the right direction on a case. If it’s not Bobby, who is it? 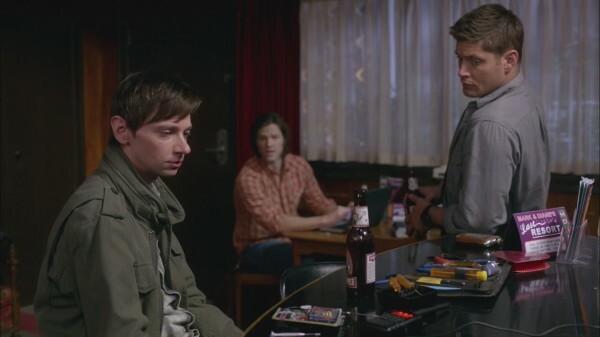 Plus, Garth picked up EMF on Bobby’s flask, the one that Dean keeps carrying around with him and taking convenient sips from in his attempt to be a functioning alcoholic. 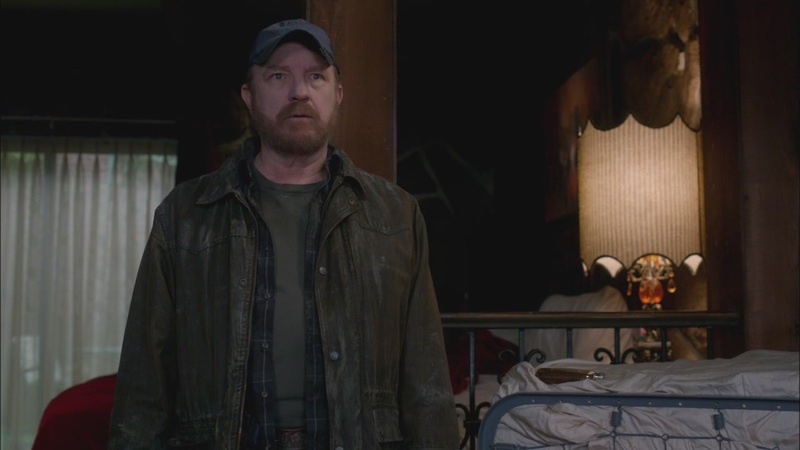 I have long said, in multiple reviews, that despite them giving Bobby a hunter’s funeral, his spirit could still be tied to that flask. 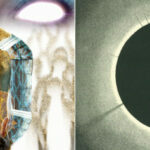 Garth mentions the possibility, too, so it’s a good theory. Sam was thinking along these lines way back when the beer incident took place. So, he did what any hunter would do in that situation, he researched. Sam took out a talking board and tried to contact Bobby, but it was a no-go. Sam thinks they’ve just having normal reactions to mourning and he’s got his brother convinced of it, too. For once in their lives, they could be going through something normal, right? "I’m right here, you idjit!" 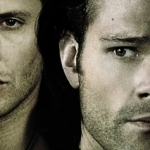 Of course they can’t have normality, they’re Winchesters. Weird things follow them around like a lost puppy. 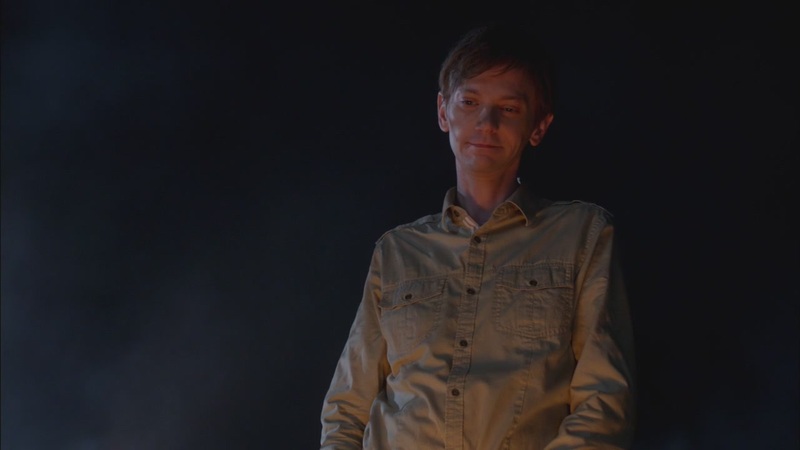 We got what might be the biggest surprise in Supernatural history at the end of this episode. Bobby’s been following them around. Or, more to the point, Dean’s been dragging his ghost around the country by the power of alcohol. When the boys leave their motel room, ready to hit the road, the camera pans around and we see Bobby! He’s there, he’s always been there, except his boys can’t see or hear him. He can move things, which he’s done, but he can’t communicate with them yet. Give him time, he’ll get there. For now, we can all rejoice over the return of Bobby, in a slightly less-corporeal form. He’s back, Idjits.